Why are pulses considered a superfood? Pulses are packed with fiber, protein, vitamins and minerals. Pulses have also been shown to lower the risk of diabetes and heart disease, lower blood pressure, lower cholesterol, and also help with weight loss. Being a vegan, pulses make up a huge part of my diet. I personally LOVE chickpeas and lentils the most. Pulses contain twice the protein of quinoa! Yes! If you buy pulses in the dry form vs the canned, you will save so much money. Not only that, but you also don’t get the added sodium that you would from canned foods. A serving of lentils cost 10 cents to quinoa’s 59 cents! If you are unfamiliar on how to prepare dried beans, you can check out this post. Why does the UN care about pulses? Pulses are good for the environment because they have a lower carbon footprint than almost any other food group. They enrich the soil therefore reducing the need for chemical fertilizers. Pulses can be grown in developing countries or right here in North America. Want to make this recipe? Watch the video below! For more videos, you can subscribe to my You Tube Channel. This budget friendly soup will comfort you on those cold winter days! In a large stock pot, add all the ingredients, except the kale. Bring to a boil, then cover, turn down and simmer until the lentils are soft. About 30 minutes. For the last 5 minutes of cooking, add the kale. Serve immediately or refrigerate for later. This soup should last at least a week in the fridge. It can also be frozen for up to 6 months. Enjoy! Thanks! I love all things lentil too. Just got some black beluga lentils I can't wait to try. Hi Melissa..the video shows the spice sage as one of the ingredients, but the ingredient list calls for thyme. Oh, how I love this recipe! I actually eat a similar soup nearly every single day. 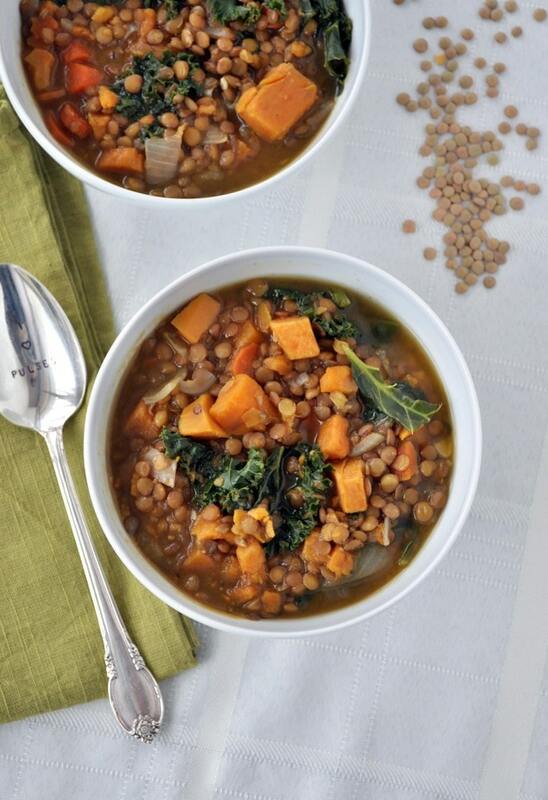 Lentils and sweet potatoes are two must-haves for me! :) Thanks for sharing!! Would you recommend making this in a crockpot? If so, how long on low? I think you could on low for 6-8 hours? Does anyone know about what causes spina bifida OR birth defects in the unborn? I'm wondering how MY beautiful daughter ended up with a birth defect and I DID everything right? Some say it's from the pesticides IN the veggies I ate during pregnancy? Please Melissa? Bring awareness TO this? GOD BLESS YOU Sweetheart XOXOXO. Love the soup! Hi Laura! Bless your beautiful daughter! I know some medications can up your risk. One that I take does and I had to be on extra folic acid when I was pregnant with my girls. I love pulses. I'd love to say that the budget friendly thing is what makes me love them so much (I'm a student after all...) but... THEY'RE JUST SO YUMMY!!!! I can't wait to try this soup! How did you prepare the lentils? We're the precooked or soaked? I don't have a bay leaf or or green lentils, just red ones. Not sure red lentils will work in this. They are smaller and will turn to mush. Omitting the bay leaf is not a problem though. I made this tonight and it's perfect! Thank you for sharing the recipe. This is a delicious and easy to make soup! Thank you for sharing! You're welcome Dana! Glad you liked it! This soup looks yummy! I was hoping to pop it into my thermos and take to class but I'm worried the kale might get mushy? Has anyone tried this and with what result? Really loved this recipe! I substituted herbes de provence for thyme and a few rainbow carrots in place of the two small carrots. It was the perfect balance of savory and mildly sweet. Thanks for sharing this one! You are so welcome Jenna! Glad you liked it. Love filling soups! I am out of sweet potato at the moment and have a lot of butternut squash to use up - will the flavor be compromised in any way?